Samsung today announced the pending launch of Samsung Rewards, a loyalty program for its Samsung Pay mobile payment service. Moving forward, people who sign up for Samsung Rewards will be able to earn points with Samsung when they use Samsung Pay to pay for goods and services. 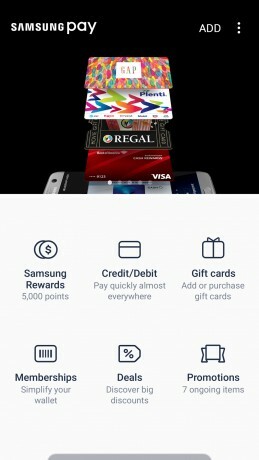 The Samsung Pay rewards points can be redeemed for Samsung products, vouchers for Samsung.com, Samsung Rewards Visa Prepaid Cards, and gifts cards to select retailers. Samsung says it will let Samsung Rewards enrollees "double dip" with their credit card issuer. Samsung Pay users will earn rewards points via Samsung Rewards and may also earn rewards points through their credit card issuer. People who sign up for Samsung Rewards during November or December will receive double points on purchases made during those months. Samsung says its rewards program will eventually expand to include other Samsung products and services, like Samsung.com and S Health. Samsung Pay is limited to a small selection of Samsung's high-end smartphones, including the Galaxy S7, S7 Edge, and Galaxy Note 5. Facebook today announced Facebook 360 for Gear VR, a dedicated app to help Samsung device owners find and consume 360-degree Facebook content. The app is available to compatible Galaxy devices, such as the Note 5, S7, and S7 edge.